The parent graph of cosine looks very similar to the sine function parent graph, but it has its own sparkling personality (like fraternal twins). Cosine graphs follow the same basic pattern and have the same basic shape as sine graphs; the difference lies in the location of the maximums and minimums. These extremes occur at different domains, or x values, 1/4 of a period away from each other. Thus, the two graphs are shifts of 1/4 of the period from each other. Find the values for domain and range. Calculate the graph’s maximum and minimum points. Sketch the graph of the function. with the five key points plotted. It repeats every 2-pi radians. 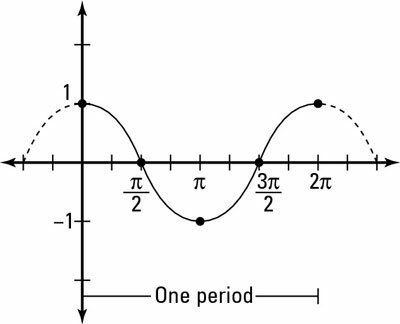 This repetition means it’s a periodic function, so its waves rise and fall in the graph. Even though the input sign changed, the output sign for cosine stayed the same, and it always does for any theta value and its opposite.